1922 Thousands attend the opening of the three-span concrete arch Swift Island Bridge, built with Federal-aid funds across the Yadkin (Pee Dee) River in North Carolina. In 1926, the bridge must be demolished to accommodate construction of a dam 9 miles downstream. The North Carolina State Highway Commission and BPR appoint an advisory committee to conduct tests on the bridge for the benefit of future bridge designers. The committee's report, approved November 8, 1928, appears in the December 1928 and January 1929 issues of Public Roads. In addition, BPR's Office of Motion Pictures releases a 20-minute film showing the method of loading, test apparatus in place, measurements being taken, and scenes of the bridge's destruction with explosives in experiments by the War Department. Yadkin (Pee Dee) River Bridge opening ceremony. 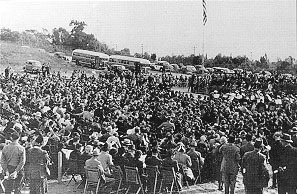 1961 1961 Secretary of Commerce Luther Hodges, Administrator Rex Whitton, NPS Director Conrad Wirth, and State and local officials participate in a ceremony opening the 5,900-foot Woodrow Wilson Memorial Bridge, which will carry Capital Beltway traffic across the Potomac River. Mrs. Woodrow Wilson, widow of the President, was to have unveiled a plaque in the memory of her husband, but she is gravely ill. 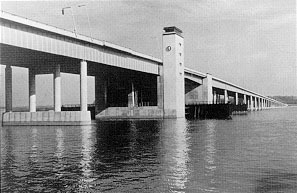 The bridge, which spans three jurisdictions (Maryland, Virginia, and the District of Columbia), was authorized when President Dwight D. Eisenhower approved House Bill 83-704 on August 30, 1954. In 1958, BPR began construction, which involved 13 contracts. The total cost of the bridge was $14 million. Only short sections of the beltway on either side of the bridge are open, but traffic on the bridge quickly reaches 18,000 vehicles per day. "There is more to a fine bridge than dollars and steel and concrete. There is beauty."